Also known as the ACR122U, this is the very latest version of this reader, with V2 firmware and an internal buzzer as well as a bi-colour (red/green) LED which can be programmed to respond when a card or tag is in field or being read/written. It is fully PC/SC and CCID compliant, resulting in easy plug-and-play installation on Windows PCs, while support for Mac OS X and Linux is also provided. Containing the PN532 controller chip from NXP, the ACR122 is also supported by various open source libraries such as libnfc. The ACR122 is ideal for use in various contactless applications and projects, ranging from payment and loyalty to ticketing and NFC. 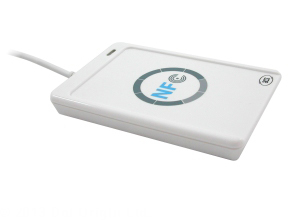 With appropriate software it can be used to read and write NFC tag data as well as emulate cards and tags when interacting with other readers or phones. We recommend all new developers obtain either the official ACS ACR122 SDK or our cost-effective starter kit, both of which include detailed code samples and helpful demos and diagnostic tools. The reader has a typical read range of 50mm. For large volume requirements the case colour and printing can be customised, or the reader can be supplied as a bare PCB module for building in to kiosks or other products. Various alternative, but compatible, versions are also available with different capabilities � for example the ACR122L comes with a counter-top stand and integrated LCD display. The ACR122 range of readers is compatible with Read-a-Card, the ID discovery software solution also available from Smartcard Focus. Read-a-Card can be used to identify different card types and to obtain the unique card ID, which can then be fed directly into other applications using its keyboard wedge function, or via various built-in developer APIs.